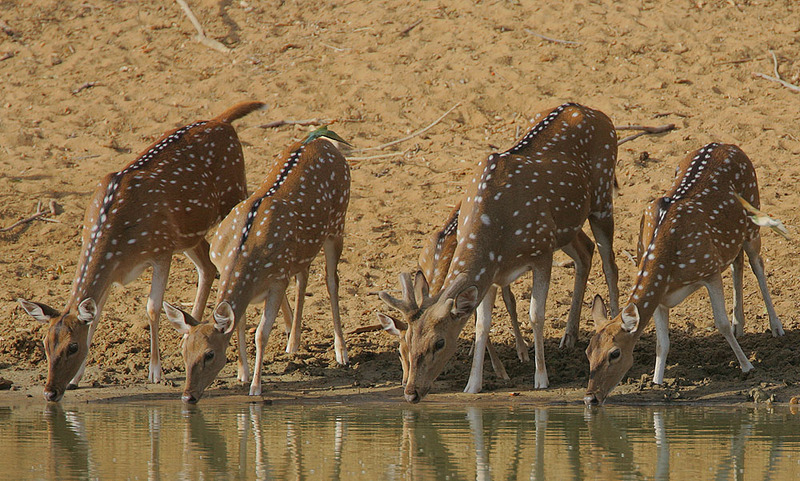 Nobody killed 21 female Cheetal spotted deer – Fek le! 21 female Cheetal deer were found dead the night of 14th January 2014 when a BJP party happened in the zoo premises, and anti-national people have jumped to the conclusion that the BJP men who partied there did it. The locals say the zoo is controlled by Neeraj Mali, the son of local BSP muscleman Shankar Mali and his family, who have about 50 criminal cases including smuggling of forest produce, between them. They organize parties on the premises. Neeraj Mali said he knew that a party for BJP men had been organized but denied that he organized it or had once been arrested from the zoo where he’d hidden after doing a murder. He also added that this was an lie, and people who wish to party in the zoo should contact him, even though he doesn’t organize such things. Seeking a way out of the controversy, the state animal husbandry department probe declared that the deaths were caused by anthrax, but the state Congress wouldn’t cooperate. Bilaspur Congress leader Vivek Vajpeyi said there was a “human role” in the deaths. “They did not die on their own. Someone caused these deaths,” said Vajpeyi. Other attention seekers are asking why anthrax caused such massive deaths on one night and nothing before or since. We tried reaching some Anthrax bacteria for comment, but they were not to be found in the area. Dr R M Tripathi, Dr Anup Chatterjee and Dr Ritesh Swarnakar who conducted the animal husbandry department probe suggested that their objective of framing the BJP party done, they had fled to evade the police. In the meanwhile, BJP supporters are trying out the theory that anti-national people had killed the deer before 8pm, when they were supposed to have been observed alive, and kept the carcasses moving to fool the guards. Offering condolences to the bereaved 33 deer and Congress leader, he said that 21 was an auspicious number and that when 21 females of any species died, they went straight to heaven, and their deaths should not be grieved. In any case, Principal Chief Conservator of Forests Ramprakash has taken steps for damage control “The allegation that some men partied inside the zoo is false. It is a closed enclosure, no one can go inside,” he said. He had never heard of poachers or Neeraj Mali’s arrest from the zoo some years ago and insists that there were only 33 deer in that enclosure and reports of 21 dead female deer are malicious fabrications. A Fek Le investigation has uncovered the true happenings of that night. BJP men were sleeping peacefully in their homes when terrorists spread a rumor that they were partying and unleashed Anthrax bacteria on 21 unsuspecting does in the enclosure and not on the other 33 deer, to make the murder look suspicious. Then they unleashed their specially genetically engineered nocturnal crows to make a few cuts on the deer. Lastly, they created holograms of BJP men having a party inside the zoo so that suspicion would fall on those innocent men fast asleep in their beds. Aam Aadmi Party has said that such things happen when BJP and Congress are in power and to vote for the common man’s party and people could decide by consensus about if killing deer is all right instead of inventing all these stories. Tagged cheetal, crime, murder, spotted deer.